This photo was taken long before I was ever thought of, probably in he late 1930s or early 1940s. Both Paris twins are shown: Elek (Alex) on the left on Emil on the right. There were times as I was growing up when it was difficult to tell one from the other, but here, it is clearly my Dad on the left. What’s the giveaway? 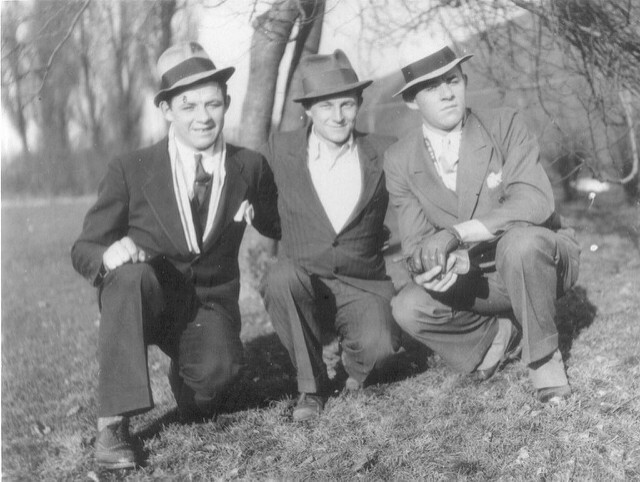 My Dad was always a bit scruffier than my Uncle, who in this picture is actually wearing spats over his shoes and, in general, is more stylishly dressed. Unfortunately, I inherited my father’s sense of style and have always been described as scruffy. The Paris twins were born in what is today Prešov-Solivar in the Republic of Slovakia. When they were born in 1911, it was merely a province of the Austro-Hungarian Empire, primarily under Hungarian administration. Although Elek and Emil chatted in Slovak whenever they wanted to hide something from me, both of them were more comfortable speaking Hungarian. They had a hard life because they were abandoned my their parents in the famine that struck the area after the First World War. They had decamped to the United States, while Elek, Emil, and their sister Margit had to fend for themselves in the foothills of the Carpathians around their town. They were aided in this by an aunt, Dorcsa, whom I met in 1977. Much of the time, they hunted for mushrooms and frogs to feed themselves. In 1929, the family was reunited in Cleveland, Ohio; but there was always bad blood between the parents and their children.